The Chinese yuan weakened against its major currency rivals to kick off the trading week as the latest gross domestic product (GDP) figures were released. And it was not pretty for the world’s second-largest economy, though some traders are finding needles in a haystack with government data. On Monday, China announced that its official economic growth totaled 6.6% in 2018, which represents the slowest pace since 1990. This is in line with what the market had anticipated, and it is down from a revised 6.8% in 2017. In the fourth quarter, gross domestic product (GDP) growth came in at 6.4%, down from 6.5% year-over-year growth in the third quarter. This does match median estimates. On the data front, industrial output advanced 5.7% last month, beating expectations of 5.3% and November’s 5.4%. Retail sales surged 8.2% last month, up from November’s 8.1%, and is in line with forecasts. Real estate investment rose 8.2%, down from 9.3% in November. For 2018, property sales by area climbed 1.3% compared to the same time from the previous year. The announcement comes as the People’s Bank of China (PBOC) pumped $83 billion into its banking system, a record amount of cash injection in a single day. Experts warn that this could be a sign the national economy could be under tremendous pressure and conditions are worse than what is being reported. Earlier this month, the government reaffirmed its decision to cut its reserve requirement ratio next week. This is the amount of money that financial institutions are mandated to have — there were four of these cuts in 2018. The federal government has complemented this move with tax cuts and state stimulus. Beijing has also reportedly proposed to increase its imports of US goods to $1 trillion a year by 2024, a move that would eliminate its surplus with the world’s largest economy. The USD/CNY currency pair jumped 0.29% to 6.7983, from an opening of 6.7788, at 17:37 GMT on Monday. 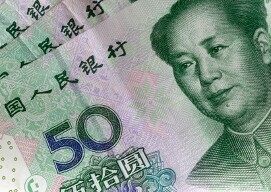 The EUR/CNY edged up 0.31% to 7.7280, from an opening of 7.7038.